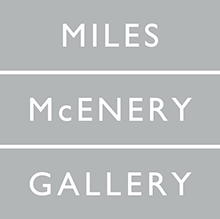 Building on the rich tradition of geometric abstraction, three one-person exhibitions take the visual language of line, form, and color in compelling directions. 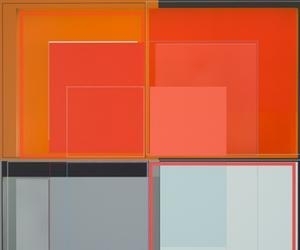 In the first part of the 20th century, artists such as Wassily Kandinksky (1866-1944), Kasimir Malevich (1878-1935), and Piet Mondrian (1872-1944) explored a vocabulary of simple geometric forms—rectangles, triangles, squares, and line—in abstract compositions that addressed universal truths and utopian ideas. This tradition, carried forth, expanded, and transformed over the course of the 20th century, continues into the present with innovative approaches to the genre by:	Patrick Wilson Ruth C. Horton Gallery Los Angeles artist Patrick Wilson creates luminous, sumptuously colored abstract paintings composed of richly layered geometric forms—lines, squares, and rectangles. A consummate colorist, he works with acrylic on canvas, meticulously deploying a palette of potent colors that range from muted grays and blues to intense vermilions, bright greens, yellows, and deep purples. Superimposing what seem like disarmingly simple geometric forms—on top of, beside, or inside each other—Wilson devises complex modular sequences that achieve mesmerizing visual effects. Odili Donald Odita Grand Lobby and Miles C. Horton Jr. Gallery Odili Donald Odita's geometric abstractions masterfully mine the expressive and metaphoric power of line, color, and form in brilliantly colored canvases and site-specific wall paintings. Beginning with line and often painting directly on walls, Odita transforms simple geometric forms into elongated triangles, trapezoid-like shapes, or irregular bands of color that stream, intersect, and diverge from each other. Manfred Mohr Sherwood Payne Quillen '71 Reception Gallery One of the early pioneers of the digital art genre, Manfred Mohr was one of the first artists to use computers to create works of art. As early as 1969, Mohr began using algorithms to explore new territories in the visual arts, and in 1971 was the first artist to be presented in a solo exhibition in a Museum with works entirely calculated and drawn by a digital computer. He has since developed a prolific and varied oeuvre based on a rigorous exploration of the logical structure of geometric forms—cubes, hypercubes, lines, and planes, and the relationships among them. Fundamental to the algorithms Mohr creates to generate his work are the rules of geometry, logic, and mathematics..